The electric fence charger circuit presented here is basically a high voltage pulse generator. The super high voltage is derived from a commonly used automobile ignition coil. An astable multivibrator is used to generate the required frequency to drive the ignition coil. Another astable is used to control the pulses supplied to the fence. If you have large agricultural fields and desperately need to protect the crops from uninvited guests like animals and possibly humans, then this electric fence charger device is just what you are looking for. Build and install it yourself. An electric fence is an electrified high voltage barrier which produces painful shocks if physically touched or manipulated. Thus such fencing basically function as deterrents for animals as well as human intruders and stop them from crossing the restricted boundary. The present circuit of an electric fence charger is designed and tested by me and has proved sufficiently powerful for the application. The fence charger circuit is able to produce voltage pulses up to 20,000 volts, needless to say about the fatality rate involved with it. However the pulses being intermittent, provides the subject with enough time to realize, recover and eject. The generated pulse is so powerful that it can easily arc and fly-off between short distances of around a cm. so the fencing conductor needs to be separated adequately to avoid leakages through arcing and sparking. If not tackled, may drastically reduce the effectiveness of the unit. Here the generation of high voltage is primarily carried out by an automobile ignition coil. The winding ratios of an ignition coil are specifically designed and intended for creating high voltage arc between a two closely spaced conductors inside the ignition chamber to initiate the ignition process in vehicles. Basically it’s just a step-up transformer, which is able to step-up an input applied voltage at its primary winding to monstrous levels at its output or the secondary winding. SOME POINTS OF THE CIRCUIT AND THE IGNITION COIL IS VERY DANGEROUS TO TOUCH WHEN POWERED. ESPECIALLY THE IGNITION COIL OUTPUT IS TOO LETHAL AND MAY EVEN CAUSE PARALYSIS. Let’s diagnose the proposed electric fence charger circuit more deeply. In the CIRCUIT DIAGRAM we see that the entire circuit is basically comprised of four stages. The voltage collector and firing stage and the super high voltage-booster stage. TR1 and TR2 are two normal step-down transformers whose secondary windings are connected through SCR2. TR1 input primary winding may be selected as per the country specification. However, TR2 primary should be rated at 230 volts. IC 555 along with the associated components forms a normal astable multivibrator stage. The supply voltage to the circuit is derived from the secondary of TR1 itself. The output from the astable is used to trigger the triac BT136 and the whole system, at a particular fixed intermittent rate as per the settings of P1. During the ON periods, the triac connects the 12 volt AC from TR1 to the secondary of TR2 so that a 230 volt potential instantly becomes available at the other end of TR2. This voltage is fed to the voltage-firing stage consisting of the SCR1 as the main active component along with a few diodes, resistor and the capacitor C4. The fired voltage from SCR1 is dumped into the primary winding of the ignition coil, where it is instantly pulled to a massive 20,000 volts at its secondary winding. This voltage may be suitably terminated into the fencing. The high voltage generated by this electric fence charger will need to be carefully applied across the whole length of the fence. The two poles from the ignition coil connected to the fence wiring should be kept at least 2 inches apart. The pillars of the fence should be ideally made of plastic or similar non conducting material, never use metal and not even wood (wood tend to absorb moisture and may give path to leakages). Please increase the TIP122 base resistor value to 10K for reducing increased dissipation from the transistor. Adjust the 1M pot such the ON time of the IC 555 is much shorter than the OFF time, for reducing current consumption. 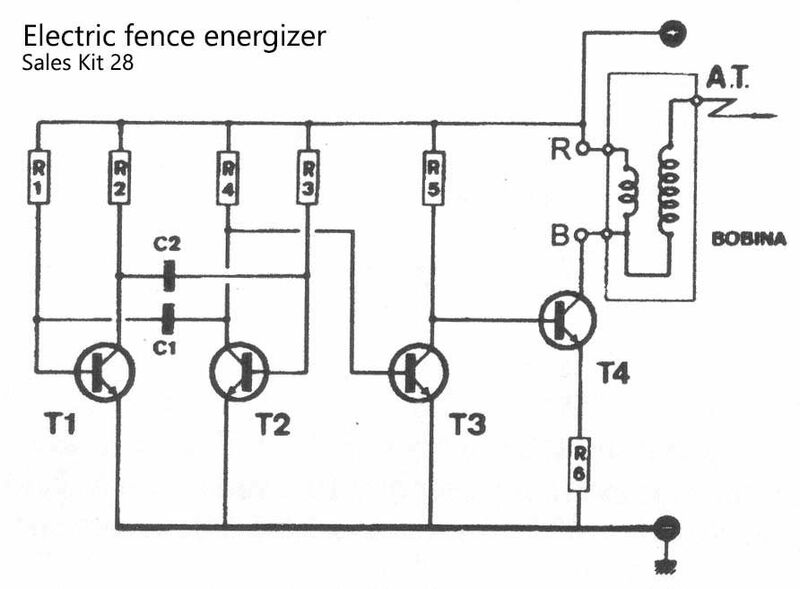 The discussed fence charge above is relatively lager and stronger with its specifications, if you need something smaller, then the following mini fence charger circuit can be quite handy, an may be used for driving away pests like cockroaches, slugs, worms, snails from any desired small premise such a terrace garden, balcony pot plants or simply for guarding food stuffs etc. The top part of the transformer winding basically delivers a reinforcement to the base of the transistor by means of C2 the T1 keeps being confined on to the conduction status until C2 charges completely, ending the latch and compelling the transistor to commence the conduction sequence afresh. R1 that may be a 1K resistor is installed to restrict the base gain for T1 to secure inhibits whereas VR1 that could be a 22k preset could very well be tweaked for acquiring an effectively pulsating T1 rate. The transformer could possibly be any iron-cored step down transformer (500mA) commonly employed in transformer version AC/DC power supply devices. The output immediately across the transformer output may be at the evaluated secondary level, for instance whether it is a 220V secondary, in that case the output could possibly be anticipated to be with this levels. The above degree could possibly be even more heightened or stepped up by means of the connected diode, capacitor charge pump set-up corresponding to cockroft-walton power generator system. The set-up boosts the 220V level to scores of volts that could be compelled to spark across an accordingly deployed finish terminals of the charge pump circuit. The above end high tension end terminals could be appropriately wired up across the whole length of the area which needs to be guarded from the bugs and for implementing the intended fencing charging operations. The fence charger wires must be separated by some minimum distance so that the sparks do no keep flying of even in the absence of any external intrusion from the insects. The explained mini fence charger circuit concept could be furthermore utilized in mosquito swatter bat purpose by swapping the iron cored transformer with a ferrite core counterpart. 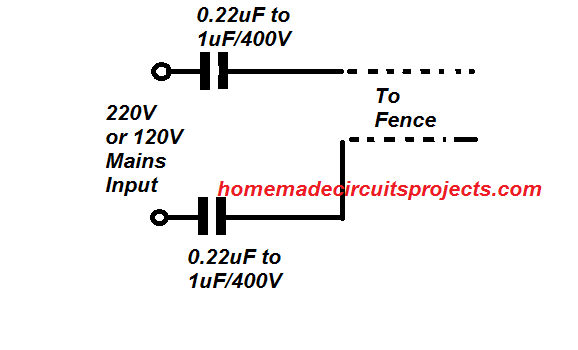 If you have an access to a 220V AC or 120V AC mains input within reach, then perhaps the following simple capacitor based AC fence energizer circuit could be used for the purpose without incorporating any kind of complex circuitry. The capacitor may be selected depending on the level of electric shock needed for the application. Note: Although capacitors are used for dropping the input current to significantly lower levels, still the output from this system may be large enough to kill any living thing if it happens to get stuck or entangled in the fence and is subjected to the current for a longer duration of time. I have assembled an Electric fence energizer from a commercial kit and it works perfectly with an old car ignition coil. The problem is that it ends with a 12V-7.2Ah / 20hr battery in less than 24 hours. And it is the same battery that feeds another Electric fence energizer of industrial manufacture for 3 weeks. Can any of you tell me how to reduce the consumption of this assembly? Hi, you can try increasing R2, R4 to 470 ohms, or upto 1K. and decrease the value of the 33uF to 22uF or 10uF. Please check the results and let me know! Hello, I appreciate your quick response. Now I am traveling, when I return I will make the changes you recommend. I have made the changes you suggested and the results have not been as expected. When I decrease the value of 33uF, electric discharges are accelerated and consumption increases. I have tried to increase the capacity to 100uF and the electric shocks decelerate a bit, but the consumption does not decrease much. With the resistors I have increased its value up to 1K and, contrary to expectations, the electrical impulses have increased a lot. I do not understand the behavior of the circuit. the circuit is a simple transistorized astable multivibrator where the two transistor sides oscillate alternately with a delay time determined by the values of R1/R3, and C1, C2, …or simply all the 4 components combined decide the ON/OFF intervals. Higher values will give higher pulse delays and vice versa. To avoid confusion it is better either to change C1/C2 or R1/R3. When the values of these components are equal on both sides then the pulse delay time is equal on both sides meaning we get 50% ON/OFF timing across the two transistor collectors. But suppose if you increase or decrease either C1 or C2 will result in the pulse delay across the transistor collectors to change and become un-uniform. In other words one of the transistors will produce narrow pulses while the other transistor will produce wider pulses. Narrow pulse will allow short switching time of the transformer and therefore low battery consumption and also weaker sparks, while the wider pulses will cause higher consumption and stronger pulses. So you have to identify with trial and error reducing which capacitor reduces the pulse intensity. Keep testing with reduced values until you identify the right consumption value. And increasing R2/R4/R5 values will definitely help to reduce the overall consumption because in doing so the switching current through T1, T2, T3 will reduce proportionately. Since T3 inverts T2 pulses, adjust one of the capacitors such that T2 gives wider pulses, this wll cause cause T3 to conduct more and reduce T4 conduction and help to reduce the battery consumption. If someone had a circuit that does the same functions but with a reduced battery consumption, I would appreciate it very much. Sir, in above mentioned mini fence charger circuit, what is the value of the TRANSISTER “T1” ? if i need to get 8kw from this ciruit, what kind of changes has to be done? obviously it’s the high tension cable from the ign coil block which you should use for the shock. With the DC Circuit how much area of the farm can be covered? maximum? Hello Bharghav, you will have to test it practically, it will be difficult to assume it.. In my country we have a huge problem with armed car hijackers. I want to know if I can install your unit in a car so that it can be activated when you are high jacked. I want to connect it to the chassis of the car so that when the hijackers touch the car they will be shocked by the high voltage. Hopefully this will deter them and they will seek easier targets. Do you think this can work? I am especially concerned that high voltage can cause a spark in the fuel tank of the car. I am afraid that may not be possible, because the car body is huge and this might make the impact very weak, and even if it was made strong it can't affect the intruder since the intruder would be wearing shoes, and without an earthing the shock would become ineffective, so the concept won't work as assumed by you. The charger design discussed here is not considered low-impedance output is it? If I understand correctly, a low impedance current would have a final transformer with a low ratio winding. 1)The output pulse length is short,if adjust the 1M pot. 2)Not work with 12v Dc Battery. Ok, I will give I try. But beside this car bobbin everything seems to be clear to me . Thanks Swagatam, one more question, the high voltage bobbin I have has primary with marks 15 and -. The secondary of Tr2 going to one primary of the bobbin I suppose to + (15). From SCR , end going to minus (-) and earth of fence. End of C4 going to bobbin secondary. The other end of secondary bobbin going to fence(high voltage). My bobbin is from a car, and has short with one end of primary and one end of secondary. Will this work in this way? Sorry Bursach, I am not quite able to figure out your trafo specs from those markings. I think these Tr are not ferrite. yes, these can be used! Thanks Swagatam, I suppose 2×1.25A= 2.5A for Tr1 with 30VA and 2x12V will be enough ? Ok, I will make my own. Can I use for example Myrra transformers to montage to pcb? The second Tr I have is 2×1.25A, is it sufficient or it has to be just 3A? Hi Swagatam, is there any PCB for both circuits? Sir, since the output voltage we get is in pulse how can we measure output voltage? Can we use this circuit to energize 4KM ? working length is 200m to 40km. Therefore can you kindly advice me. Gom, pulse width can be set by adjusting the 22k resistor value appropriately. however I am not sure about the joule calculation,, you can probably do it by yourself. for 40km length you may have to install many such circuits at appropriate intervals for enabling an effective outcome from the units. Thank you for your reply. Let me try it . can we remove TR2 and use direct 230 ac ? if removed tr2 and trigger SCr from 555 will work ? In your drawing the SCR will instantly burn, since it's directly connected across the mains…and anyway it looks dangerous. whats cause for that ? I can specify the leg orientation here, but it would be better if you check it through an image. it will get hot, you will need to add a heatsink to it…..also try increasing its base resistance from 1K to may be 22k or even higher. can tip122 replace with MOSFET irfz44 in 12v dc model or BT136 replace with MOSFET irfz44 in AC230 model to solve hitting problem ? any idea about make alarm circuit when fence wire is short. hello vikas, it could be implemented using a current sensor stage…..if possible I'll try to update it in the above article. i want to make solar fence enegiser. i m from chemical field so don't have technical info.so plz guide me for the same. can we have ready made circuit for energiser? I haven't used traic before so please suggest me suitable values for the resistors and how much collector current would be enough to operate BT136? It's correct, the resistor can be any value between 2k and 10k as the triac would require just 15mA or even less to trigger fully. 1) According to the circuit description, the right transfo should be labelled TR2 and the the left one as TR1. 2) What is the purpose of the diode in the lower right corner, next to the capacitor? 3) Is it important to connect one lead of the primary to one lead of the secondary, of the 2nd transformer? 2)the diode is for grounding the negative spikes. 3) yes it's very important for providing the ground to the scr with reference to its gate voltage. how can i measure the ampere from tranformer? a simpler solution is to pulse TR2 directly with the IC555 via a transistor or a mosfet and eliminate TR1 entirely from the CDI circuit. it's current that may be lethal, not voltage, it will depend on the transformer current rating. The capacitor accepts and stores the 220V input, and in the process when the firing limit of the SCr is crossed, the SCR fires and shorts the capacitor leads across the connected winding of the coil discharging the cap voltage into the coil. This discharge is stepped-up by the coil to the specified levels at the high tension output….so this is how it works. the negative terminal is the ground point. the positive terminal goes to C4. the central top cap is the high tension terminal.